Before I move on from reviewing hood films, to other areas of black cinema, culture, and history a bit of a palate cleanser is necessary. Oh, hello Don’t Be a Menace in South Central While Drinking Your Juice in the Hood, I didn’t see you there on Netflix! Don’t Be a Menace... if you didn’t already guess, is a satirical parody of the very hood films I’ve been reviewing thus far. The movie was panned upon its release and currently has a 29% rating on rotten tomatoes. Despite the negative reception, at its core Don't Be a Menace... is a wildly outrageous and funny movie, with a sharp eye and understanding of the material it's mocking. Story? Narrative? What are those? At best, the film has a loose narrative, which structures a coming-of-age style hood film in the vein of Boyz in the Hood and Menace II Society (two of the films it satirizes the most). The plot’s main purpose is to move the film along around different jokes and gags that poke fun at the genre. That’s fine, as long as the jokes and gags are funny, and they are. All of the main characters are composites from this genre with Boyz and Menace getting the most nods. The movie tends to meander, coming back to its shoestring plot to advance the film, which can be somewhat grating, but overall, it's not a hindrance. Furthermore, some of the jokes aren’t funny and some gags go on for way too long at times. But other than that the film doesn’t overstay its welcome and manages to keep the length at just over 90 minutes. Ashtray (Shawn Wayans), a composite of Caine and Tre Styles, is our protagonist. Ashtray is naive to the point of stupidity and does a great job as our clueless straight man. Loc Dog (Marlon Wayans) is based off of O-Dog, and is the Watts gangbanger pushed to the absolute extreme for great comedic effect. Sometimes, Marlon's overacting does get wearisome but he and his brother have great chemistry and comedic timing ensuring that most of the jokes hit their mark. Chris Spencer plays Preach, a Furious Styles-Sharif composite who is hilariously confused about his convictions. Suli McCullough plays a downright creepy and deranged parody of Chris from Boyz with a fully loaded wheelchair complete with gold daytons. Tracey Cherelle Jones rounds out the core cast as Dashiki, a transparent woman looking for a man to take care of her and her eight kids. Most of the film’s jokes are great, and it manages to poke fun at almost every aspect of the hood films it loves so much. From the blatant “MESSAGE!” yelled by the mailman whenever some heavy handed themes are being mentioned, to the painful “There ain’t no positive black females in these movies” cameo by Vivica A. Fox, the movie really knows the films it’s mocking. Some of the scenes are deliberate shot for shot remakes with great comedic effect. The film is so dedicated to these hood films it even gets actors to play the same characters from the original films such as Toshi Tada as the Korean Store owner (from Menace), and Omar Epps making a cameo appearance as a college bound hood escapee, Malik (from Higher Learning) whose life is “tragically” cut short. Basically you’re going to get a lot more out of this film if you're familiar with the aforementioned “hood” films and the genre it's parodying. The movie isn’t perfect by any means. Some of the jokes are hit or miss, and when they fail, they fail hard. Further the movie is incredibly unfocused, bouncing back and forth with the notion of a “plot” somewhere vaguely in the distance. All that can be forgiven if the film is funny, and it is. Furthermore, it’s acutely self-aware and pokes fun at itself several times. It does a wonderful job of satirizing the hood films of the 1990’s and has neat Easter eggs in the background for its viewers to enjoy like the names for the 40z of malt liquor or the plastic on every piece of furniture. Above all this is a goofy film, it's not great, but it accomplishes its purpose: to make people laugh by spoofing at an entire genre. Yes it's dumb fun, but sometimes dumb fun is what you want after all the serious, bleak, and tragic drama. 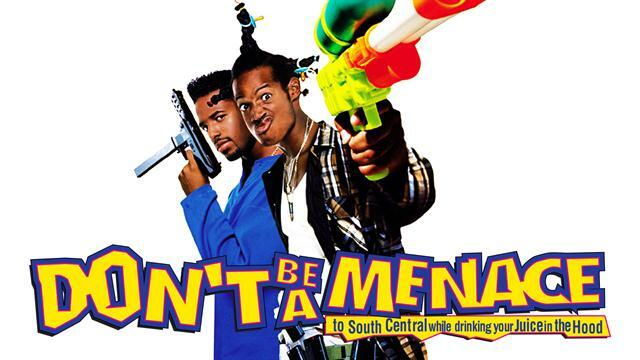 If you’re looking for a silly comedy to watch on Netflix you can do much worse than Don’t Be A Menace in South Central While Drinking Your Juice in the Hood. TLDR: Don’t Be A Menace…. is a hilarious if juvenile satire of the most famous hood films of the 1990’s and of black culture in general 3.25/5 Stars. 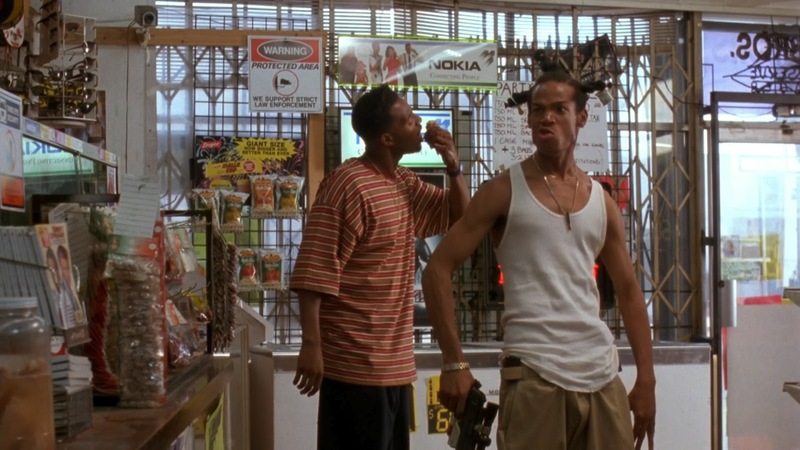 "Don't Be a Menace to South Central While Drinking your Juice in the Hood" is a parody of a lot of Afro-American movies, for instance "Boyz N the Hood", "South Central", "Menace II Society", "Higher Learning" and "Juice". We follow Ashtray as he returns to the place he grew up in and meet his father and his basket-case friends.